How different are the interiors of a high rise home? 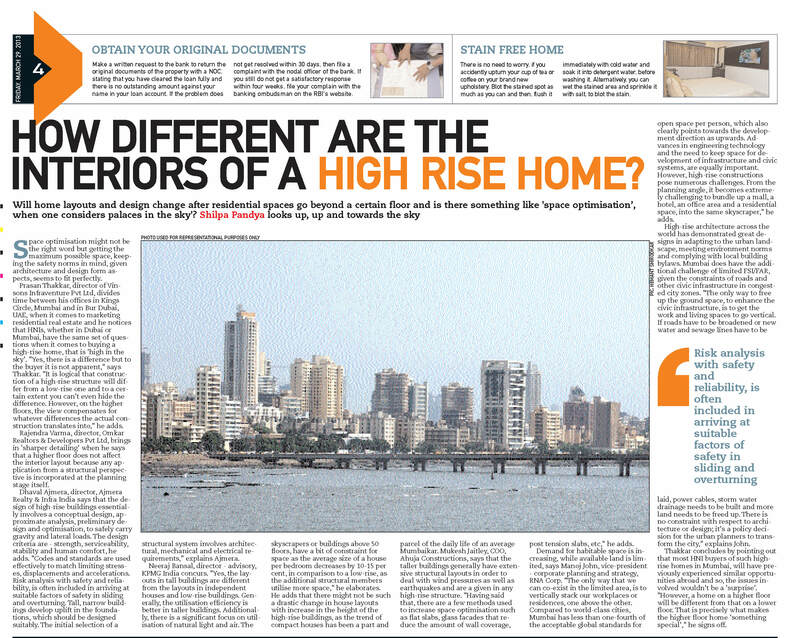 Demand for habitable spaces is increasing, while available land is limited, says Manoj John, vice president – corporate planning & strategy, Rna Corp. The only way that we can co-exist in the limited area, is to vertically stack our workplaces or residences one above the other. Compared to world-class cities, Mumbai has less than one-fourth of the acceptable global standards for open space per person, which also clearly points towards the development direction as upwards. Advances in engineering technology and the need to keep space for development of infrastructure and civic systems, are equally important. However, high-rise constructions pose numerous challenges. From the planning angle, it becomes extremely challenging to bundle up a mall, a hotel, an office area and a residential space, into the same skyscraper, ‘ he adds. The only way to free up the ground space, to enhance the civic infrastructure, is to get the work and living spaces to go vertical. If roads have to be broadened or new water and sewage lines have to be laid, power cables, storm water drainage needs to be built and more land needs to be freed up. There is no constraint with respect to architecture or design; it’s a policy decision for the urban planners to transform the city,’ explains John.